After spying these in the flesh at January’s Core Bike Show and feeling the design and quality first hand it was decided that they would be a worthy addition to one of the shop bikes! 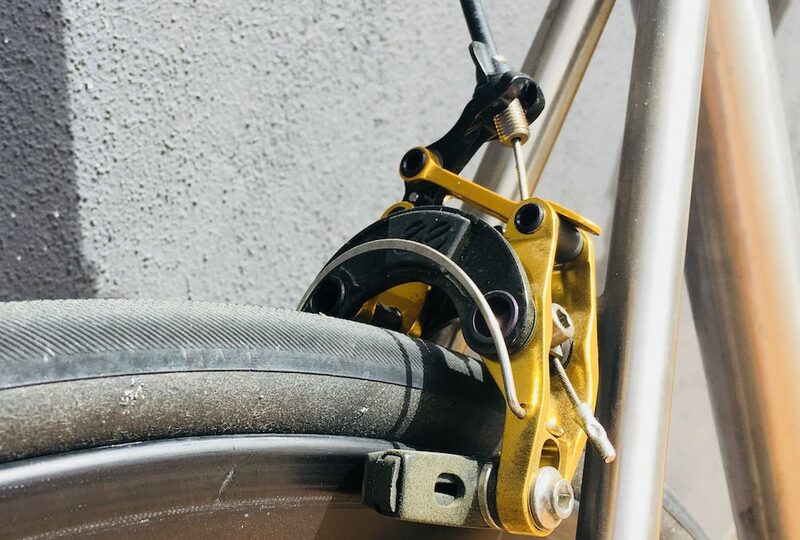 EE brakes have been around a while and hail from the USA, however the company was purchased a few years ago by Cane Creek who have brought technological improvements to the product. The EE brakes are very high quality, the intricate design looks complicated and trick but fitting was as simple as any other brake. The addition of a fine tuning adjuster for centering the caliper is a welcome addition. Just note that they will require new longer brake outers when fitting. This particular set are the El Dorado edition which other than some ‘bling’ gold anodising are just the same as the others. 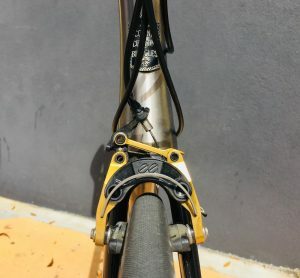 For those concerned with aero properties, the EE brakes are a winner in this category as it was immediately noted once fitted that they tuck neatly inside of the fork and rear stays and don’t ‘stick out’ when viewing the bike head on. Needless to say these brakes are light, in fact very light. At just 182g a pair they are on the specialist light weight side of the market. From our experience this usually involves a compromise and when it comes to brakes that means lack of power or modulation. 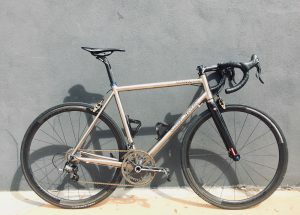 After the first ride of the EE’s fitted to an Abanicos running Campagnolo and full carbon rims, it was immediately apparent that performance was not going to be an issue. 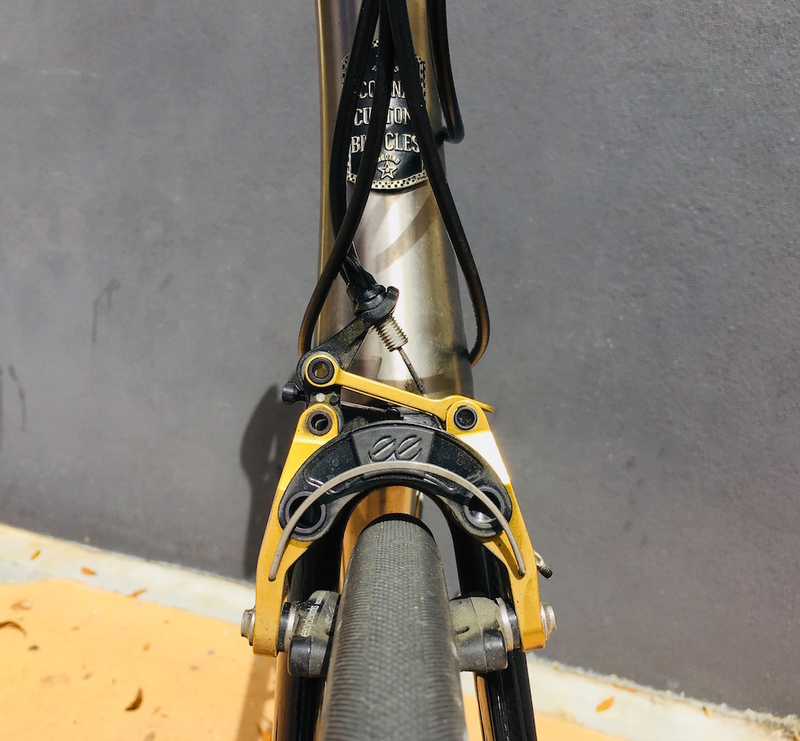 Modulation is excellent, just as good as the original Campagnolo calipers. Power is also excellent with a nice lever feel which feels positive yet light. It’s really all thumbs up for these brakes. Light, attractive, with the quality you would expect from a specialist bike component. Naturally they aren’t light on the wallet at £299 per brake, however if you’re looking to fine tune you ride, loose some grams or just fancy something a little different then they would be a worthy purchase. They are also available in direct mount format.